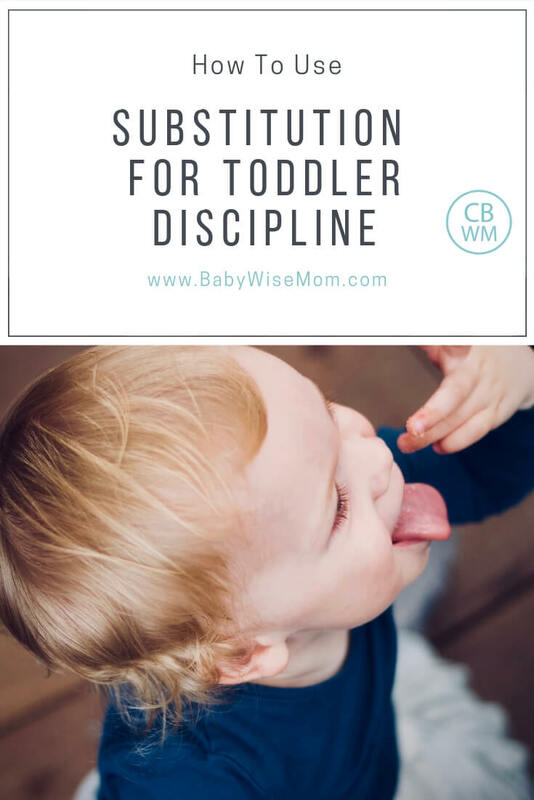 How to use substitution as a tool when your toddler does something he shouldn’t. This is a great discipline tool for the toddler age range. In On Becoming Toddlerwise, the authors suggest you don’t distract or suppress, but rather substitute until novelty wears off (page 26). What exactly do those words mean? Keep in mind this advice is for the toddler. Your child is in his second year between ages one and two. Your toddler is interested in everything. He wants to know how everything works and what everything feels like. Many of these actions in and of themselves are not wrong, it is just the situation the child is doing it in. An example from the book is playing in the dog dish. This is undesirable because the dog’s water is not clean water. I grew up with animals. The rule was the animal’s water be kept clean enough you wouldn’t mind drinking from it; even in that condition, it isn’t clean. Splashing in the dog dish also might not be desirable based on location; perhaps it will get your floor all wet with dog water. However, the action of splashing water in and of itself is not a bad action. There are appropriate places this can be done. You could put your child in the tub with a bowl of water and let him at it. If you were to suppress this action, you would never allow splashing under any circumstance. You would find your child splashing the dog’s water, tell him he isn’t allowed to do that, and that would be the end of the conversation. If you were to distract from this action, you would offer a different activity to do at the time. You might offer his favorite toy, a treat, a walk, etc. With substitution, you still allow the activity to happen, just under the proper circumstances. As I stated above, this is such a great tool because many actions aren’t unequivocally wrong; they are just wrong (or undesirable) in certain locations or at certain times. 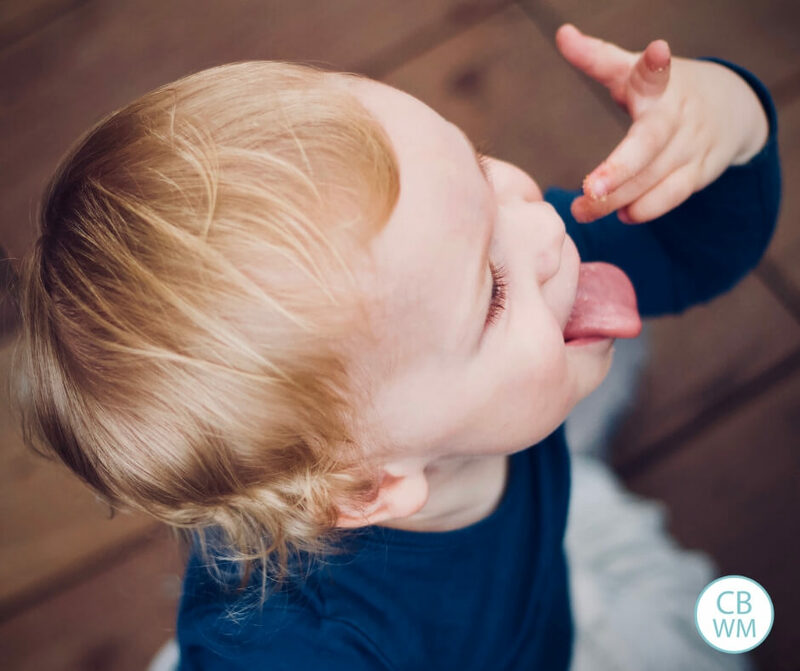 As Toddlerwise points out, a toddler wants to do a certain action until the novelty wears off. By allowing certain actions to take place in certain locations, your toddler does it until he is tired of it. It doesn’t become a constant battle between the two of you and he is able to learn from this new activity, provided you lead him in the right direction to do so. This doesn’t mean you have to allow your child to do all he wants when he wants. You can have “no touch” zones that are simply off limits. With most things, however, you should be able to think of something your child can do that is similar that is acceptable to you. Also, be ever mindful that you do not over restrict nor under restrict your child. An example of suppression for our family is spitting. When Brayden was much younger, he became enthralled with spitting his drink back into his cup. He also liked to spray what he was drinking from his mouth. This isn’t okay for me. I told him he was not allowed to spit at the dinner table, but he was allowed to spit in the bathtub (so long as the water stays in the bathtub). Keep in mind that some things are pretty much universally unacceptable to people, but others are family-dependent. Things that are okay with you aren’t necessarily okay with your neighbor, and vice-versa. You have to decide what works for you and your family and set your own rules for what is and isn’t acceptable. While doing so, be sure to keep in mind what an activity will look like to you a year from now or two years from now. Maybe your 12 month old’s gentle splashing in the pristine dog water is of little concern to you. You don’t mind the little mess. How will you feel when he is 3 and a bit stronger? Remember the concept from the Baby Whisperer: Start as you mean to go on (Baby Whisperer: Start as You Mean to Go On ) and also the Babywise concept of parenting in the funnel. Don’t allow freedoms now you know you will take away in the future (See How to Know What Freedoms to Give Baby for more on this). My 14 month old LOVES to play with the T.V. remote control. So, my husband gave him an old one (he took the batteries out) to play with. Now when he wants to play with a real remote, phone, or cell phone; we give him his very own substitute remote.It’s super cute to watch him talk into it like a phone, while I’m on the phone talking! I know, you really get to know what strange little habits you have when your kids start to mimick you!